Posie Harwood, who finds the best back-of-the-box recipes in the grocery store, discovers a better way to eat your mashed potatoes this year. Let's talk about mashed potatoes. 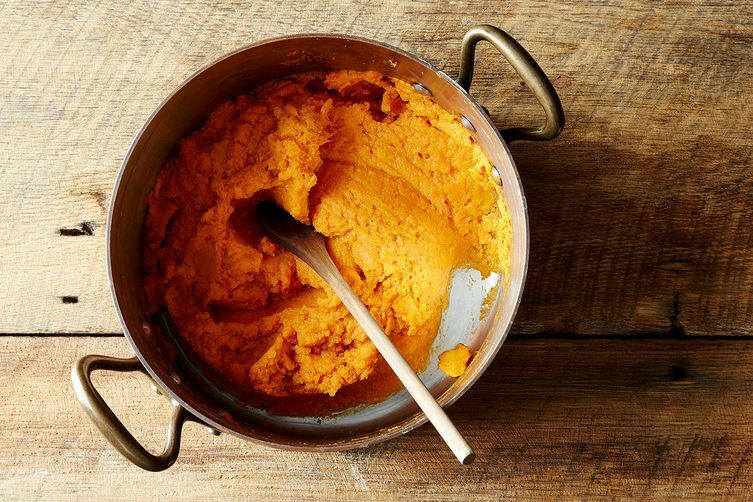 Specifically, let's talk about mashed sweet potatoes. What if, instead of eating your vegetables with a fork, you ate them in the form of a light, airy, squishy roll? I've heard there is an ongoing struggle with parents about how to disguise vegetables so that children will eat them. Not having children myself (and having been a child who truly loved broccoli from the get-go), I can only imagine how difficult this makes dinnertime. Luckily, the world is full of clever ways to consume vegetables: Turn butternut squash into a vibrant pasta dish! Put kale in your scones! Top your potatoes with sweet sugared streusel. Here's the thing to keep in mind: These sweet potato rolls aren't good even though they're a vehicle for vegetables—they're good because of it. Potato breads are notoriously delicious little devils, impossible to stop eating and solely responsible for the success of many a burger. These sweet potato rolls are all of that, in a dinner roll: airy, delicate, and tender. They have a slight sweetness that absolutely begs for a schmear of butter and a sprinkling of sea salt. I suspect they'd be very good dunked in gravy. If you're already making mashed sweet potatoes for your Thanksgiving casseroles, make some extra and whip them into buns. In a mere twenty minutes, I pulled together the dough and started the first rise. To shape them, you just roll the dough into balls and toss them into a greased pan. Let them rise again, then bake. Alternatively, use your leftover mashed potatoes and bake these the day after Thanksgiving. I can't imagine a more perfect vehicle for slider-style day-after-Thanksgiving sandwiches layered with cranberry sauce, roast turkey, lettuce, and mayonnaise.